Make waves. Turn heads. Enhanced with Digital T3 SinglePass® technology, the T3 SinglePass Wave Wand is designed to create shiny tousled waves in just one pass. A smart microchip continually monitors and adjusts power to minimize heat fluctuations and maintain consistent temperature. High-performance ceramic heaters ensure even heat, free of hot spots, for one-pass styling. The 1.25”- 0.75” tapered T3 Tourmaline® and ceramic barrel glides smoothly through hair to create a frizz-free, shiny finish that lasts. 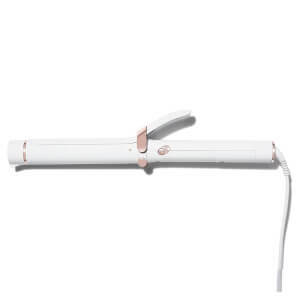 Designed with 5 adjustable heat settings (260-410 ̊F), this wand offers maximum styling versatility. With a lightweight body and sleek design, it ensures a truly effortless styling experience.